I named her Miss Piggy because when I feed her if the other cat gets near her food, she will get on top of her bowl and blow out her nose while she eats. 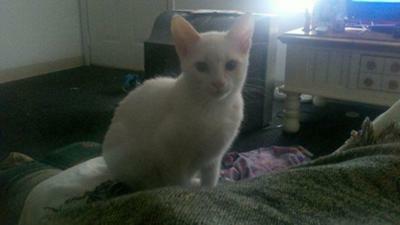 Also, she has that cute pushed in pink nose! She has blue eyes too. Every time I go to the bathroom she runs in there and has to sit in my lap an I have to pet her. She also loves it when I wash my hair over the bath tub. She gets between my legs and looks into the bath tub at the water while I wash it. She is the sweetest kittie. Note from admin - Click on each thumbnail to enlarge picture. Miss Piggy is too cute for words! I love her baby pictures... she looked so fluffy. Now she looks so elegant. A lovely cat. Thank you for sharing! She is adorable! 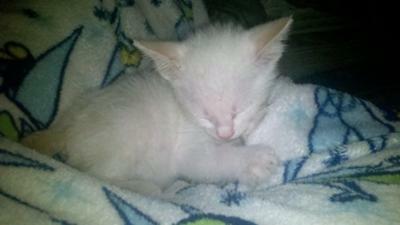 I wanted a blue-eyed white kitty so bad. I searched shelters for weeks. 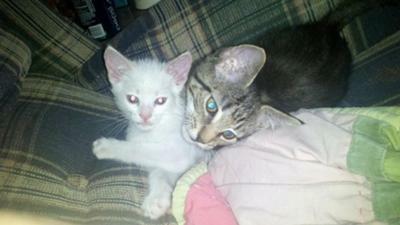 But in the end my Merlin and his twin brother Yuki (white with yellow-green eyes) won out. Like Miss Piggy, Merlin thinks I can't be safe in the bathroom or any other room without him. And Yuki, who lives with my daughter lands on her shoulder from their couch when she gets home each day so he is sure to be in whatever room she goes to. I don't know how she does it. Merlin and Yuki are heavy solid cats. Miss Piggy is beautiful. When she is protecting her food, does she make cute little talking noises? She sounds feisty enough.